Why is my heart rate monitor going crazy? Have you found yourself asking the question, “What’s going on with my heart rate monitor?” It’s acting erratically, giving you widely divergent readouts, and telling you that your heart is beating at a level more normal of your Grandma Edna or your dog Fido. And you know for a fact that there’s no way your heart is beating that slow or that fast. What the *#$& is going on?!?! As much as we love our heart rate monitors and as much as we’d like to think they’re perfect tools for us modern-day athletes (especially given the price we paid for them), they do have one Achilles’ heel characteristic of all modern-day gadgets: they require a sufficient signal from your heart rate transmitter for an accurate reading (heck, even the venerable iPhone 4 has signal issues). No Synchronization: For your heart rate monitor to work, the transmitter must be in “sync” with the watch unit. Syncing entails the initial connection between the transmitter and watch, so the watch knows the signal it’s supposed to pick-up. The syncing process must be performed if you’re using the heart rate monitor for the first time, and the process varies with each watch brand. Refer to your heart rate monitor’s manual for syncing instructions. Dead or Low Battery: Most heart rate transmitters require a battery, which is usually the size of a common watch battery. In many cases, the battery is dead or too weak to enable the transmitter to emit a strong enough signal to the watch. Simply replace the battery with a new one. If you do, make sure you replace the battery cover and any other accessories (such as rubber “o-ring”) exactly as you originally found it on the transmitter. If not, the transmitter may no longer be waterproof and you may permanently damage it. Improper Wear: Perhaps you’re wearing the transmitter improperly. The transmitter is attached to a strap that must be worn around your chest. Specific instructions for proper wear vary with each brand, but generally require you to wear the strap across you chest, right below your breasts and above your abdomen. (For those of you with bra issues, consider purchasing the Polar Heart Bra.) As Garmin puts it, the [Forerunner] heart-rate monitor is to be worn with the logo right-side up, directly on the skin just beneath the breastplate. Direct contact to skin and moisture is necessary to establish an electrical connection between your body and the heart-rate monitor.” Also, make sure that the strap is tight enough so it is constantly in contact with your skin, even while you’re moving. (For those of you with very hairy chests, consider shaving – seriously.) In addition, wet the sensors on your strap. The sensors read the electricity emitted from your heartbeats, and the water essentially serves as an electrical agent that helps the sensor better recognize the electricity. Electrode gel also helps. As Garmin states, “it may be necessary to wet the contacts on the monitor or use electrode gel to get a reliable connection established at the beginning of a workout. The ActiveWatcher knows this last point from firsthand experience; on several occasions, the ActiveWatcher’s heart rate monitor stopped going haywire only after sweat accumulated under the strap. Signal Interference: This is perhaps one of the more common sources of heart rate monitor frustration. Because your heart rate monitor relies on a signal from the transmitter, almost any other nearby electrical signal may interfere with the transmitter’s signal. The result: your watch unit can’t recive the transmitter’s signal. Common sources of signal interference include treadmills, MP3 players, bike computers, and cellular phones. In fact, if others around you are also using a heart rate monitor, you may be picking up the signal from another monitor. (In Polar parlance, this is called “crosstalk” and can be avoided by watches with coded transmission signals.) Believe it or not, signal interference may even be caused by static electricity from synthetic shirts. If any of this occurs, try moving away from potential sources of interference. If all else fails, call the manufacturer. Its contact information can be found in the watch’s instruction manual or on-line. The ActiveWatcher can tell you from first-hand experience that the watch companies are eager to help, even if your heart rate monitor is no longer under warranty. If your heart rate monitor still doesn’t work after consulting with the manufacturer, consider buying a refurbished version of the same heart rate monitor you currently have. Finally, you may have to resort to buying a brand new heart rate monitor. But if you’re anything like the ActiveWatcher, you’ll be excited about that prospect. 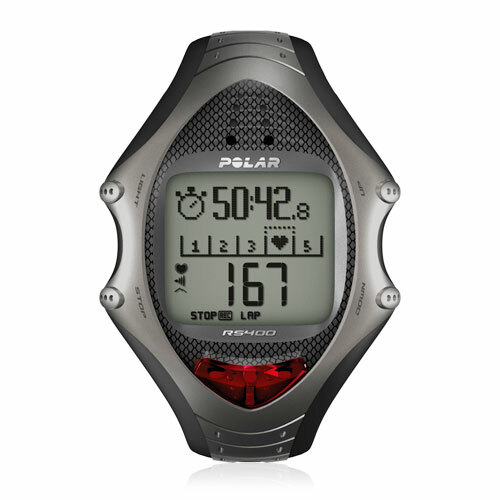 Click here to check out ActiveWatches’ broad selection of cutting-edge heart rate monitors. To be sure, you can achieve either of the above goals without a HRM or GPS watch. But wouldn’t it be great to let the watch do those things for you so you can enjoy the scenery?!?! So purchase a HRM or GPS watch from ActiveWatches today. Come visit us at www.activewatches.com. In Part 2 of this two-part series, we’re going to address a question that’s probably more important to you pragmatists out there: Why use a heart rate monitor (HRM)? Hey, if you’re going to drop some cash on a HRM, you wanna know what’s in it for you. It’s not enough that you now know how a HRM works and what it does (see the previous post). Have no fear, The ActiveWatcher is here…. First and foremost, it’s just cool to know how fast your heart is racing during a workout. I remember purchasing my first Timex HRM in graduate school. It was the iPhone of my day. I spent $400 I had no business spending — just so I can measure and see what my pediatrician did annually for a copay of just $10. It was simply cool to see that my heart rate was around 50 while studying, 60 when urinating, 70 watching the Sopranos (hat tip to HBO), 80 when playing video games, 100 on a light jog, and would increase by 5 when drinking coffee no matter what I was doing. I won’t even get into the other non-PG rated activities. My then-girlfriend got so sick of this obsession that it was one of the reasons why she broke up with me. My heart rate was 60 when she did it. Second and more seriously, a HRM allows you to monitor your pace. This is particularly important on long runs. If you’re like me, you’re not perfectly in-sync with your body; sometimes I just can’t tell how fast I’m going, especially if I’m still half asleep. In times like that, a HRM monitor is perfect; it tells you how much energy you’re exerting, thereby indicating whether you need to speed up or whether you should stay at your current pace. Third, a HRM as one of the best indicators of fitness improvement. Run a fixed distance at a fixed pace one day. Run the same distance at the same pace a month later. If you did the latter at a lower heart rate, you’ve officially improved your fitness. How, you ask? Because a lower heart rate tells you can do the same amount of work with less energy exertion. Keep up the great work! This obviously works for any type of exercise/activity. Fourth, if you’re doing an interval/repeat workout (e.g., running, then jogging, then running again, and repeating this a number of times), a HRM will tell you when you’re body has recovered adequately to start the next interval/repeat. (In addition to telling you whether you’re starting off too fast. If you’re more interested in reading about HRMs and how they can help your training, a good article is posted on Active.com, one of my favorite sports/fitness website. You can get the article by clicking here. It’s somewhat technical, but it’s great if you can follow it and if you’re interested in how other concepts come into play, such as VO2 max and lactate threshold. Of course, if you’re interested in purchasing a HRM, visit our website at www.activewatches.com. The ActiveWatcher often comes across many questions regarding heart rate monitors (HRM). In this post, I’ll try to demystify the most basic questions of what they do. Doctors and athletes measure heart rate for a reason. Harken back to our grade-school health class. The heart has a extra-special status among our family of ugly organs. In a nutshell, it’s a muscle that pumps and sends necessary blood — the red stuff that carries oxygen — throughout the body, including other organs. It sends necessary nutrients and carries away unnecessary waste. The more energy we exert, the more oxygen-filled blood the body needs. You may say you know how much energy your body is exerting based on how you feel (a concept referred to as “perceived exertion”). This is true, and there’s no argument there. But a HRM is arguably a more accurate biometric indicator of energy exertion. So think of a HRM sort of like one of the gauges in your car. When you’re in your car, you can probably tell roughly how fast it’s going or how much the wheels are turning, but the gauges give you actual information. Another significant point is that your heart rate depends on many factors. As described above, your level of exertion dictates your heart rate. But your level of exertion can be affected by a number of factors. Cue the common culprit: body temperature. Running in 90 degree heat versus a picture-perfect marathon temperature of 55 degrees will easily increase your heart rate. Another one is the level of exhaustion your body is feeling: lack of sleep the night before a run equals a slight uptick in your heart rate. So tying all of this together and in the simplest way, your heart rate represents the amount of energy your body is exerting, as dictated by a number of internal and external factors. Of course, if you’re interested in purchasing a HRM, visit our website at www.activewatches.com, where you can find an array of heart rate monitors suitable for any activity. Stay tuned for Part 2 of our two-part session on HRMs, which will address the question of why you should use one.